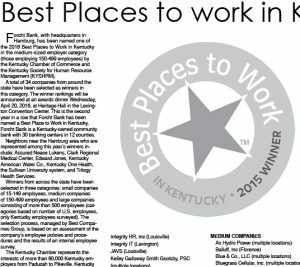 Forcht Bank, with headquarters in Hamburg, has been named one of the 2016 Best Places to Work in Kentucky in the medium-sized employer category (those employing 150-499 employees) by the Kentucky Chamber of Commerce and the Kentucky Society for Human Resource Management (KYSHRM). A total of 34 companies from around the state have been selected as winners in this category. The winner rankings will be announced at an awards dinner Wednesday, April 20, 2016, at Heritage Hall in the Lexington Convention Center. This is the second year in a row that Forcht Bank has been named a Best Place to Work in Kentucky. Forcht Bank is a Kentucky-owned community bank with 30 banking centers in 12 counties. 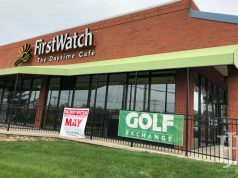 Neighbors near the Hamburg area who are represented among this year’s winners include: Assured Neace Lukens, Clark Regional Medical Center, Edward Jones, Kentucky American Water Co., Kentucky One Health, the Sullivan University system, and Trilogy Health Services. The Kentucky Chamber represents the interests of more than 90,000 Kentucky employers from Paducah to Pikeville. Kentucky SHRM consists of 13 local chapters that provide ongoing education and leadership opportunities for over 2,700 human resource professionals throughout the Commonwealth. 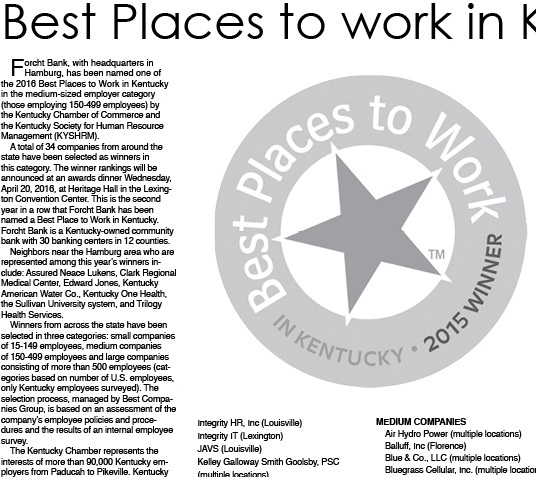 For more info about Best Places to Work in Kentucky, visit www.bestplacestoworkky.com. This article also appears on page 6 of the February 2016 printed edition of the Hamburg Journal.